Who knew that Aladdin celebrated Christmas? show off a number of Nativity sets. I hope I haven't offended anybody--that wasn't my intention! I chose those particular dolls just because they were handy! I don't know if this is the most politically correct Barbie photo I've ever taken or the most politically INcorrect. 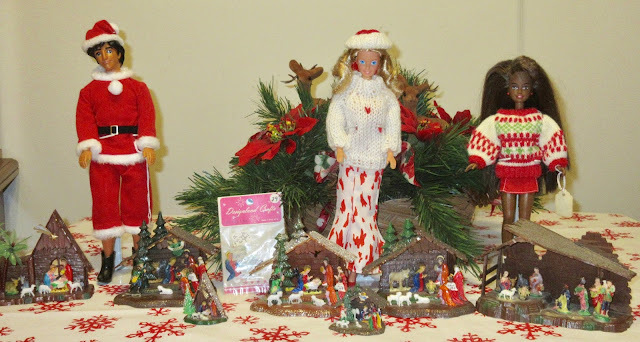 The photo really isn't about the dolls--it's about the Nativity sets. They were made in Hong Kong and sold by a company called Shiny Brite in the 1960s and 1970s. They were a dime a dozen during those decades (alliteration!). Now they are easy to find for sale on the Internet but are expensive. Only occasionally do I find them for a small price at an actual event. 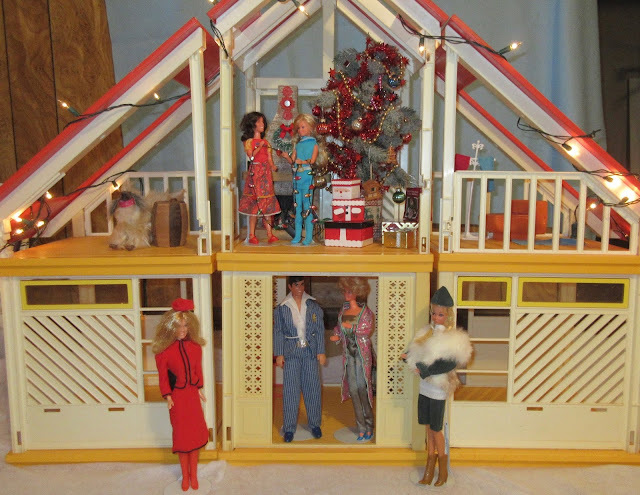 I became aware of these plastic manger scenes in the late 1960s and early 1970s when my sisters and I played with Barbie dolls. 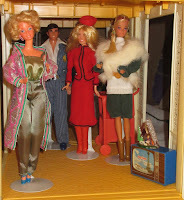 The two tiny ones in front were the ones my family had, and I knew even then that they were Barbie-size (the term 1/6 scale didn't exist yet). The five bigger creches were ones I found as an adult, at garage sales, antique shows and on the Internet. Did you know that once upon a time you could buy replacement figures? That's what's in the pink and white package. Fast forward 50 years. The most popular 1/6 scale Christmas ornaments of the 21st century are the little yarn sweaters that you can buy at many gift or specialty stores. They even come with tiny hangers so that you can place them on the tree. Although they are all "Barbie-size," the dolls cannot always wear them. If you get one that is machine-knitted with tiny yarn and tiny knit stitches it will not stretch out and you won't be able to get it over either the doll's head or her hips and and arms. You need to get the ones that are hand-knitted with bigger needles and stretchier yarn. I wanted my dolls to show off my tiny Nativity collection because I bought all those crib sets with them in mind. 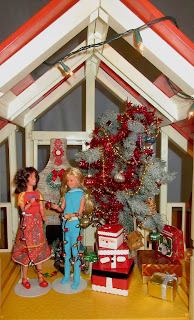 (See my previous story about my Barbie Christmas card--one of the photos includes the tiny triangular one.) 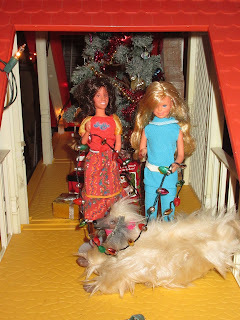 So I chose three dolls that were already semi-dressed appropriately for Christmas. On the left is Magic Carpet Aladdin in a Santa Claus suit I purchased from the JC Penney catalog some time in the 1980s, plus the boots from 10742 City Cowboy Fashion with Hat N Boots. Both the doll and the cowboy outfit are from 1994. I had redressed Aladdin a long time ago in that outfit and chose him to wear the Santa suit because he already had on black boots. I realize the character of Aladdin is probably Muslim. But then I remembered that the original St. Nicholas was from Turkey, so he probably had Mediterranean or Semitic features anyway. My Barbie is a Fun to Dress doll in the skirt and heels from 3310 West Side Look, both from 1988, plus an oversized which sweater with red hearts that matches the skirt. Lastly is a 1995 African-American Pizza Hut Skipper in her original skirt, shoes and socks and another matching sweater that was probably machine-knitted but used larger needles. I made my own Christmas cards to send out this year. Barbie, of course! 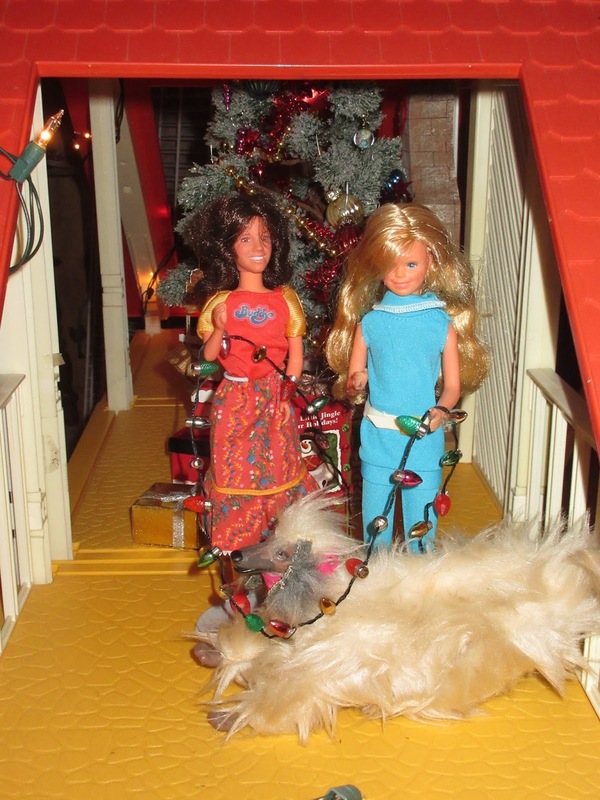 In January 2018, I decorated the 1978 orange, yellow and white Barbie Dream House with some of its furniture, plus a tree with trimmings and other small items I've accumulated over the years. All the dolls and outfits in the house were from Mattel and made between 1978 and 1982. Naturally, I took photos. Everyone admires each other's outfits. 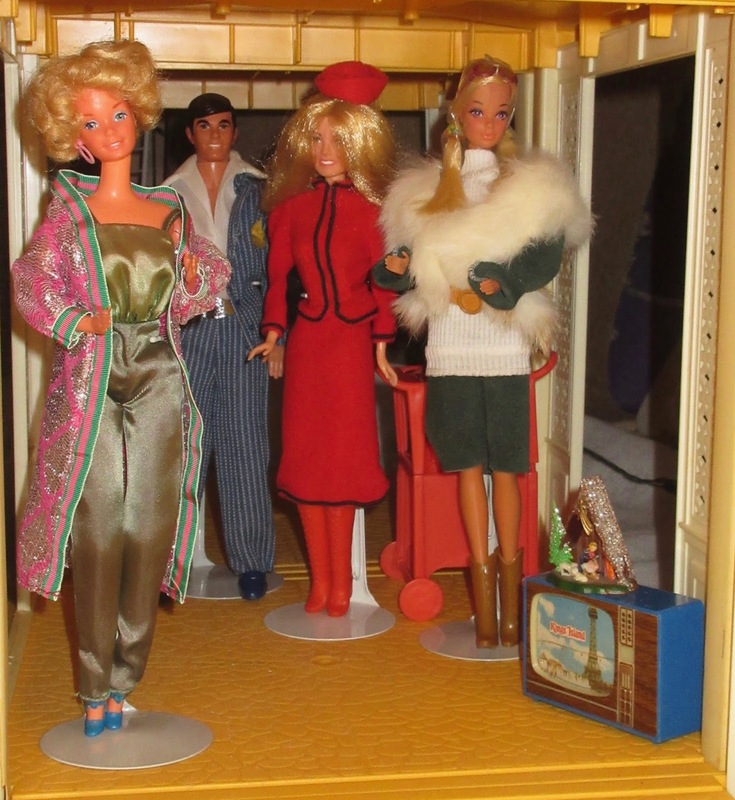 Barbie, Ken, Cheryl and PJ. to help decorate for Christmas. put the lights on the tree first,"
I bought the tree from a floral store in 2017. The gifts under the tree are boxes I've accumulated over the years; I think one of them held jewelry. The lights that Kristy and Skipper are holding are a battery-operated necklace which doesn't work anymore. I found the fireplace at a craft show years ago. If you look closely you will find numerous old items: my sister found the Kings Island TV at a garage sale--the set dates from the early 70s; and the tiny Nativity in the triangular stable is from the late 60s and was my grandmother's. The clock on the chimney also dates from the early 1970s. It was actually a child's plastic fake watch with a holographic dial. I just cut off the band and glued the watch itself over the fireplace. The oldest item were two ornaments that belonged to my father and were from the 1950s. There is a wooden barrel on the second floor, and you can kind of see a tan balsa birdhouse dangling from the tree. I do not know the origins behind the barrel and the birdhouse. When I was a little girl I'd shake the barrel and hear something inside. I realize now that the barrel was a type of puzzle and there was probably a trick to open it. I never figured out the trick. I eventually just broke open the barrel and found the birdhouse inside. 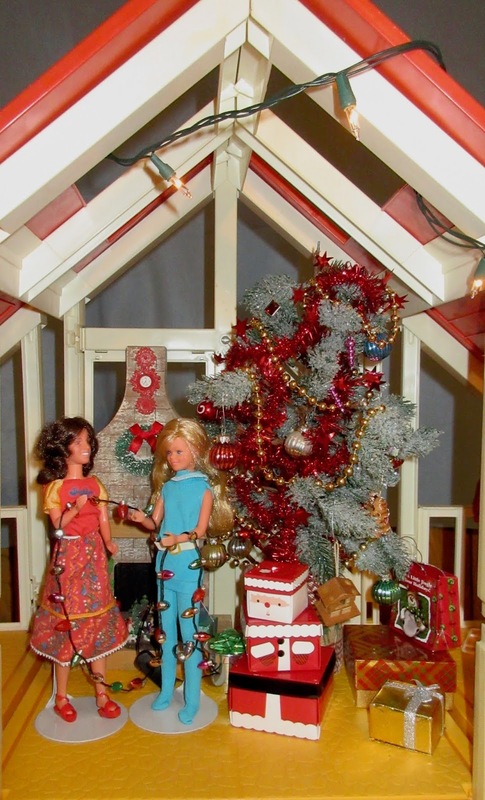 Even 40 years ago I wanted to use that birdhouse with my Barbie dolls and I finally found the ideal setting for it this year!